The PCGS Population Report℠ is a census of more than seven million coins certified by PCGS, and is the most comprehensive listing of its kind. The information it contains makes the Population Report standard equipment for anyone who is active in today's coin market. PCGS maintains an elaborate database which calculates the number of all coins which have been certified by PCGS. 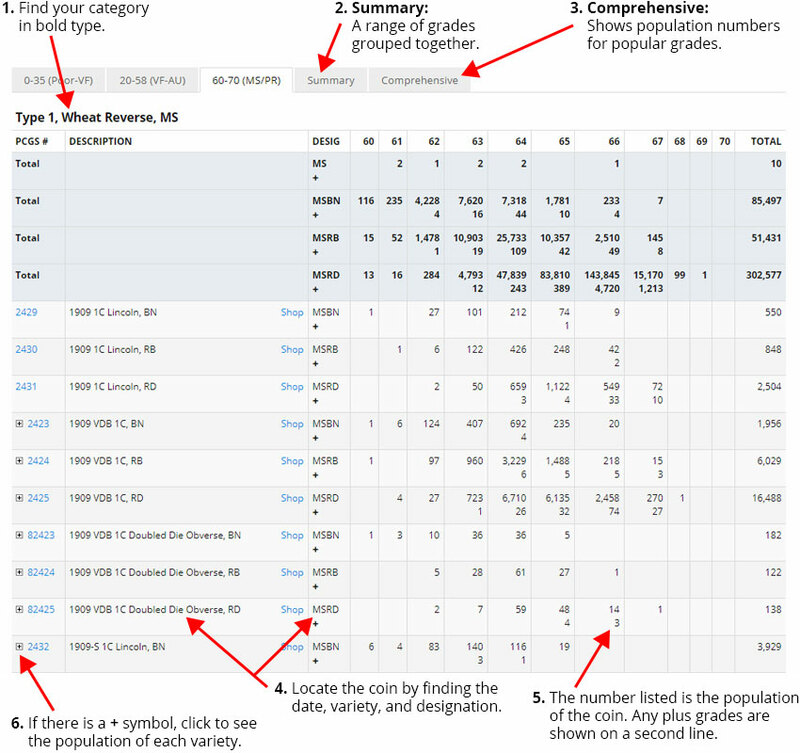 The Population Report puts all this data at your fingertips quickly and easily and is an important tool for numismatic analysis. The PCGS Population Report profiles the number of coins certified by PCGS at a given grade for each date, denomination, mint mark and variety. BECAUSE THE Population Report CONTAINS INFORMATION ONLY WITH RESPECT TO THOSE COINS WHICH HAVE BEEN SUBMITTED TO AND CERTIFIED BY PCGS, IT SHOULD NOT BE RELIED UPON TO DETERMINE ACTUAL OR RELATIVE VALUES OF PARTICULAR COINS IN THE MARKETPLACE. The values of many issues, such as most proof coins minted after 1954, do not justify submission to PCGS for grading. The populations reported herein for such coins are therefore significantly lower than the actual numbers available in the marketplace. The information contained herein is compiled from the computer data base maintained by PCGS for this purpose. Information is posted to this data base on a daily basis, and population figures for any given coin can change substantially over a short period of time. These population figures represent the number of coins processed from PCGS and may not reflect any reduction for coins that have been lost, destroyed, or removed from PCGS holders. Note that dealers often remove coins from PCGS holders and re-submit them in hopes of receiving a higher grade. Sometimes the dealers return the old inserts to PCGS so that coins can be removed from the Population Report, but sometimes they do not. PCGS makes reasonable efforts to maintain and publish accurate information, however, it disclaims any responsibility of liability for the accuracy or completeness of the information contained herein. Certain varieties recently recognized by PCGS are now included in this Population Report. The populations reported for these coins may be artificially low, and not representative of the actual number of these coins available in the marketplace.